Generation Gap: What’s worth our tax dollars? With the “fiscal cliff” looming and potential tax increases on the horizon, it’s interesting to see where Americans of all ages agree (and where they don’t) when it comes to their hard-earned dough being divvied up by the government. No big surprise, most Americans (71.2%) would rather shrink the size of government than raise taxes. 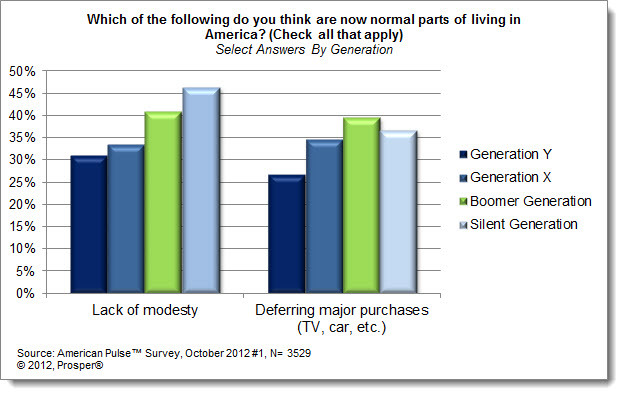 Members of the Boomer Generation (75.9%), Silent Generation (75.2%), Gen X (70.5%) and Gen Y (61.9%) agree. But where should the government cut back? Although all generations appear willing to support education and safety, the majority of Gen X and the Boomers would prefer the budget for social programs like welfare get a trim before their paychecks. You’ve heard the phrase “new normal” on the news, during conversation, in reference to the economy, etc…but what does it mean for most Americans? What has truly become part of normal everyday living in post-recession USA? 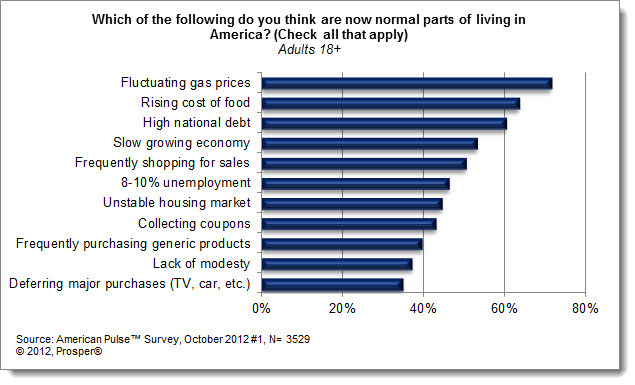 Most Americans agree that fluctuating gas prices (71.5%), the rising cost of food (63.5%) and high national debt (60.4%) are now normal parts of living in America that we just have to deal with. The slow-growing economy (53.1%) and the hassle of frequently shopping for sales (50.4%) also top the list. Although fluctuating gas prices top the list of “normal” conditions for all age groups, members of the Silent Generation (83.9%) are more likely than those in Generation Y (57.5%) to say frequent pain at the pump is part of the “new normal.” Youngsters in the U.S. probably don’t remember when gas cost less than a dollar per gallon while those in the Silent Generation might be reminiscing of the good ol’ days when you could buy a gallon or two with the spare change in your pocket. The generations also differ when it comes to modesty: not surprisingly, fewer members of younger generations notice a difference in the generally accepted code of conduct, while those in older generations are more likely to see a lack of modesty as a recent development in American living. While the disappointment of deferring purchases is lower on the list of “new normal” situations to cope with, the Boomer Generation is most likely to feel the sting here. 39.6% of Boomers consider pushing off the purchase of a flat screen, vacation home or new car as just another part of living in the U.S. of A. For comparison, only 26.8% of Gen Yers agree. For more on the “new normal,” head over to the Prosper Now Blog at Forbes.com. 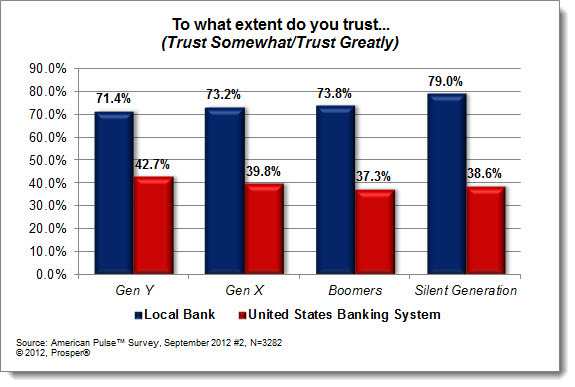 It seems as though older Americans have more trust in their local bank while youngsters are more trusting of the United States banking system as a whole, compared to other generations. 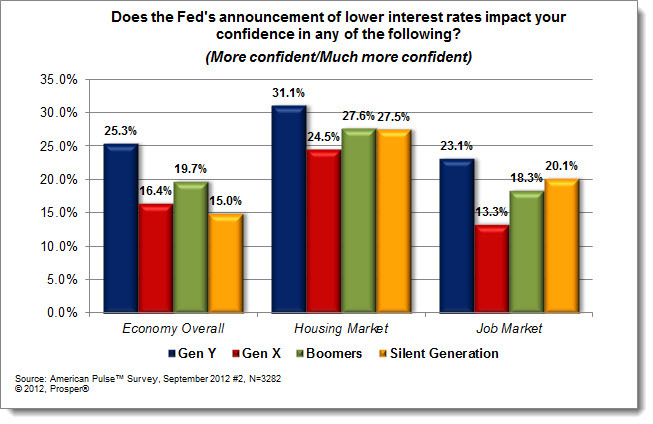 Perhaps Gen Y is more confident because this age segment is the most likely to take advantage of lower interest rates. 61.2% of members of Gen Y plan to make some type of life change as a result of the Fed’s announcement: 22.4% say they are likely to buy a car, 20.9% are in the market for a home and 20.5% plan to go [back] to school. Most members of older generations do not plan to make any life changes at this time. For more fresh insights on American consumers, including confidence in the economy, expectations for gas prices and even Election 2012 updates, be sure to check out the complimentary American Pulse™ InsightCenter! While Back-to-School spending buoyed this year and the outlook for Holiday 2012 just *might* be cautiously optimistic, the unemployment rate still seems to be the sticking point between consumers and that “recovery” word. In fact, when we asked the more than 3,000 consumers in our latest American Pulse™ survey what they believed to be the current U.S. unemployment rate, respondents’ answers averaged 11.6%. While most consumers (54.4%) felt that the rate was somewhere between 8% and 10%, nearly one out of five (a whopping 18.9%) estimates that the rate is higher than 15%, which is more in line with the Bureau of Statistics’ much less publicized U-6 rate of unemployment. So we’ve established that consumers think the unemployment rate is “high,” but how “bad” do they perceive the employment situation to be? 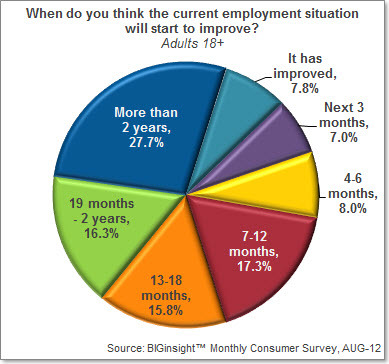 According to our latest insights for August, nearly three out of ten (27.7%) believe it will take more than 2 years for the job market to improve. Fewer place bets on 7-12 months (17.3%), 13-18 months (15.8%), or 19 months to 2 years (16.3%), while just 7.8% optimistically assert that the employment situation has already improved. Among the generations, Gen Y is the group most likely to view the outlook for employment with rose colored glasses; in fact, more than one in ten born between 1983 and 1993 is anticipating improvement in the job market within the next three months. [Holiday hiring season anyone?] The Boomer (born 1946-1964) and Silent (born before 1946) generations maintain a more long-term stance on improving employment, with about a third in each group looking beyond two years from now. Gen X (born 1965 – 1982) is more likely to follow the opinions of the general public. Now while these insights are interesting, why are they important? 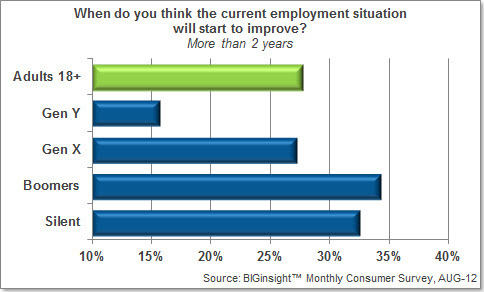 Employment remains THE key issue when it comes to discussing the slow growth and recovery of the U.S. economy. Whether on a micro (i.e. personal job security) or macro (i.e. overall economic health) level, doubt in the employment environment breeds uncertain and hesitant spending patterns among consumers. If they fear the pink slips, they’ll snap their wallets shut. If they think they’ll go another year or two or three without a raise or promotion, they’ll think twice about upgrading their homes or cars or about taking a vacation. It’s the retailers, marketers, and advertisers who are attuned to consumers’ concerns that will be better positioned to react and adapt to these realities as the economy sputters toward a long-awaited recovery. With the Back-to-School shopping season just around the corner (or already here according to some of the ad circulars I received over the weekend), we’ll soon be looking ahead to that all-important holiday shopping season. And while spending specifics are still a little off on the horizon, we queried the 8500 consumer respondents in our July Monthly Survey about the direction they anticipated their holiday gift budgets to take for 2012: north, south, or even keel from the previous year. While nearly three out of ten (28.1%) admitted that it was too early to tell, among those with a budget in mind, 10.2% are planning to spend more this year compared to last (up from 6.5% in Jul-11). Before you start ringing those jingle bells, though, keep in mind that the vast majority of shoppers plans to spend at (46.3%) or below (43.4%) their 2011 gifting budgets. Of course, holiday 2012 spending plans vary by generation*, which brings me to the subject of this post. Among shoppers with spending expectations in mind, it appears that Gen Y will be the most generous this year compared to last. Nearly one in five (17.9%) of these youngsters is planning to spend more on gifts this year; this figure declines as age increase, with just 1.1% of the Grinches Silent generation boosting their budgets this year. Perhaps it’s the holiday excitement felt among Gen Y – and even Gen X – which lends itself to Santa-like spending outlooks this year. – Not on Sale? Not for Me: Boomers (45.6%) and Silents (43.7%) are the most likely to scrimp on budgets by only buying on sale. Gen Y (35.9%) is the least likely to be swayed into saving using this method. – Pause My Purchase, Please: One out of ten of those in Gens X (9.6%) and Y (10.9%) are curbing gift budgets by utilizing layaway a bit earlier this year. 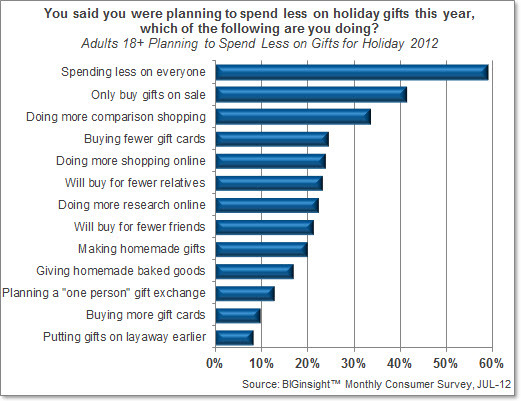 This number drops with advancing age; just 3.9% of the Silent group plans to put gift purchases on hold. – This is Pinteresting: Nearly three out of ten (29.4%) Gen Y-ers plan to pinch the pennies by making homemade gifts. 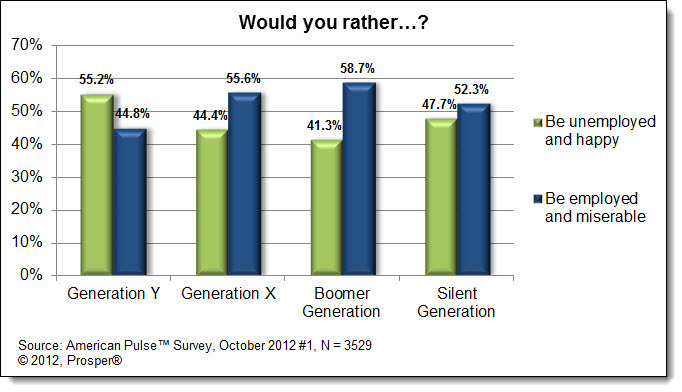 Gen X indexed on average, while Boomers and Silents are less likely to do so. Perhaps this social media site is inspiring more DIY-ers among the younger generation? Stay tuned…the holiday shopping season is shaping up to be pretty interesting this year.